New page added 1 November 2007: The Bow Drill Fire Kit . New page added 2 November 2007: The Hand Drill Fire Kit. My aims for the year are threefold: to learn firemaking using natural materials, to practise firemaking under various damp and difficult conditions, and to make up and practise using small firestarting kits containing various items (to enable a fire to be easily made under a wider range of conditions). To learn firemaking using natural materials, the first step will be to practise making fire using sparks from a "metal match". The metal match is a rod of metal that creates a shower of sparks when scraped with a sharp object (such as an old bread-and-butter knife). When I have mastered this sufficiently the next step will be a "friction fire" using the bow/drill method. UPDATE: I tried to construct a bow/drill fire a couple of years before I first wrote this web page (in 2006), but was unsuccessful at first. My problems were using the wrong kind of wood, and not knowing the first thing about what kind of tinder to use, among others. Since then I have learned a lot about friction firemaking, some of what I have learned you can see on this website. When lighting a fire using a modern device, such as matches, or a cigarette lighter, your selection of "tinder" is very easy. Crunched up newspaper, for example, or just about any dry scrunchy natural material. When lighting fire from a spark, it is much harder to get the tinder to light. 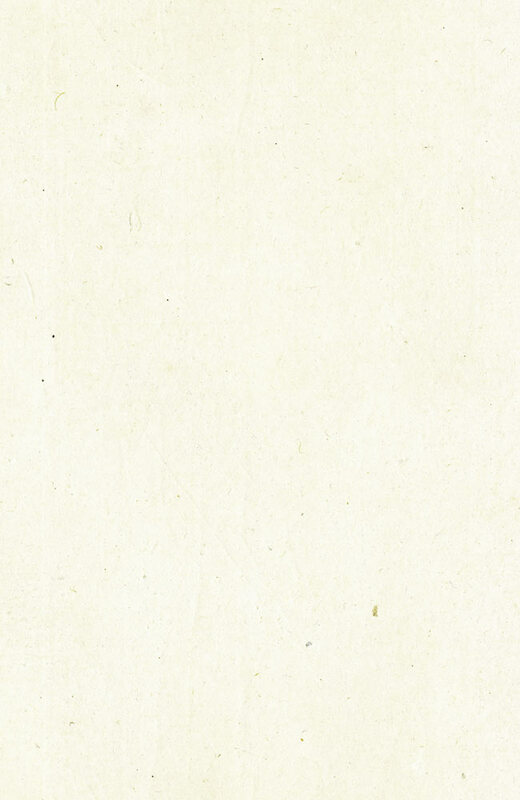 The survival books define "tinder" as any material that will light from a spark. 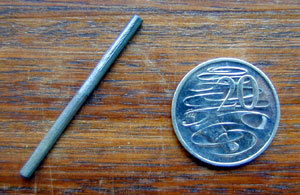 The metal match is shown in the picture below. It is a metal (actually, "Ferrocerium") rod, which you scrape with a sharp object (such as the back of a knife), and a shower of sparks is produced. I think that the main use of the metal match will be to learn how to make fire just from a spark - which will be a very useful skill, that can be transferred to other forms of firemaking. I bought this metal match from Ron Hood's online store (www.survival.com). It cost US$3.50. The link to the actual item in their online store is here. So far, with my metal match, I have learned that cotton wool balls light very easily. And lint brush lint will also light, fairly easily. Other than that I have not been able to get anything else to light - including newspaper and tissue paper. 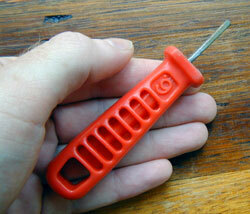 I found it a lot easier on my hands if I put the metal match into a handle, as shown in the photo. The handle was a metal file handle bought from a hardware store, it cost about $2. A slightly smaller handle would be better, as the hole was a bit large, and too much (for ideal) of the metal match was covered by the handle. If you want to know exactly how it works, this is a good article at trackertrail.com. In the picture below, notice how much of the match has been worn away by me using it. I thought these things were meant to last a long time! I saw one website advertising these for sale (they might have been a bit bigger), that they claimed could light 15,000 times! The photo shows my match after only about one week of playing with it. I don't think I am going to get 15,000 lights out of this one. If I was in the field, I would much rather have a cigarette lighter, and I reckon I would get more fires out of the lighter before it ran out. But the metal match does seem like a good way to learn what will light from a spark and what will not. 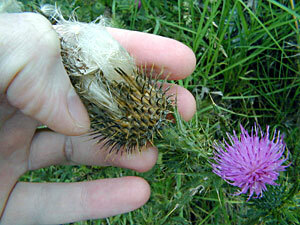 Just before it broke, I was getting very close to making fire with it, using thistledown. 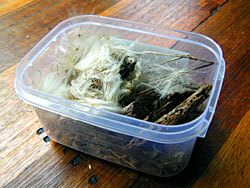 Although this is not a native plant, it is a natural substance. 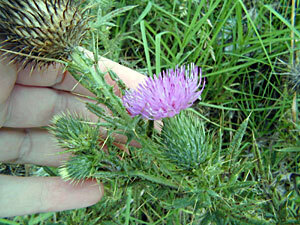 This	is a thistle of the type I used, in flower. It grows as a weed in NSW. It also has some edible parts. See here for more. Here you can see the "down" located in the seed head. 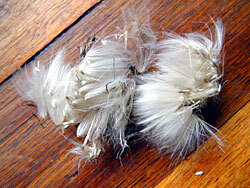 A closeup of the thistledown. You can keep your tinder materials in a small lunchbox. Perhaps a metal box would be better, then you could put hot half-burnt materials back into the box. They would make really good tinder. I haven't found a metal box yet.